It was cool and unusually rainy Saturday in Washington, not the best day for an outdoor event, but that didn’t stop more than a dozen members of the Ahmadiyya Muslim Youth Association from hosting a 5K run/walk to raise money for a local food bank and an international charity. Most of the runners were dressed in long black sweatpants topped with blue T-shirts. A few brave souls wore shorts. Some topped their running clothes with rain ponchos and struggled to keep them from flapping in the breeze. Some of the money the runners raised is going to the Capital Area Food Bank, which serves Washington and surrounding communities in Virginia and Maryland. The funds are for anyone who needs them, not just for Muslim communities. Raja, a systems engineer with a degree from the University of Maryland, near Washington, said the news media and politicians sometimes saddle Muslim youth with a negative image. He said his group’s charity work is meant to show that young Muslims can be, and want to be, productive members of the community. 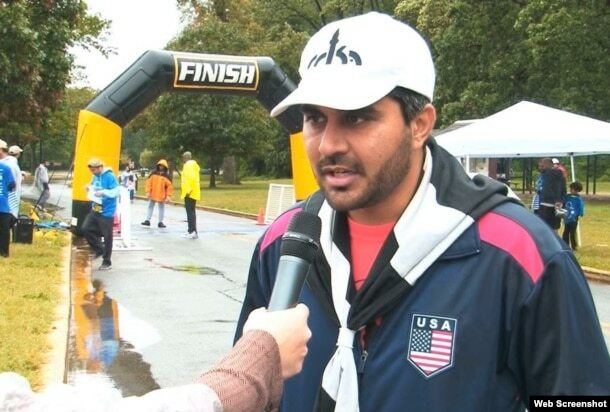 Haris Raja, national director for the event known as Walk for Humanity USA.